We aren’t all born Kennedys and Gateses. Some of us have to make our own success from scratch and for some (fine, most of us) a major indicator of that success, however unwarranted, is money. Chaching, mula, bank. There are lots of ways to get that high-earning job and education plays a huge role. But today, I am here to talk about a way to start yourself off on the right financial foot from a young age. I am here to talk about investing. For a lot of readers, investment is one of those terms you’ve only ever heard at the dinner table when your parents have those friends over for sangria, or at the doctor’s office when you overhear the guy in the room next to you (how is this all HIPAA approved? ), or in those ads with the talking baby. The truth is, investing is just a way of building your money over time by making smart decisions and being patient, and you don’t have to have “CFA” (certified financial advisor) after your name to be hip on saving. 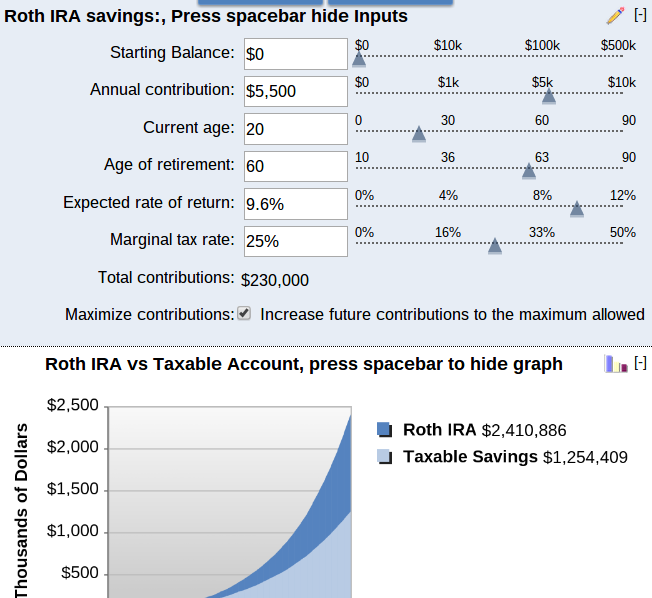 A Roth IRA is a type of account which can be started by anyone of any age. You put money into it once you receive your paycheck just like you would with your normal savings account. The difference is that you are putting the money into an investment account, so it can fluctuate with the stock market. That fluctuation is what causes you to gain an average of 9% interest on your account versus the 1% going rate your bank offers. To give you an idea of that difference, $1000 placed in an account at your local bank will gain about $10 interest over the course of a year. By contrast, that same $1000 would gain close to $100 in interest in that year in a Roth. Because we are talking about big money in interest, there is a cap on how much you can save in your Roth: up to $5500 a year. The money you contribute can be taken out at any time, which is one special feature of Roths. If an emergency were to happen, all your contributions could be returned to you within days. The interest you gain on your Roth can be removed at any time with a 10% penalty, or completely penalty free if you are over age 59 or using the money to buy a house or pay for school. Then $10000 of interest can be taken out penalty free as well, as long as you’ve been an account holder for five years. Think you’re ready to take hold of your savings for the future and open a Roth of your own? Stay tuned for my next posting in the series, Future Rich: Choosing a Roth IRA.